Used to support the 6x4 and 4x4 systems from any threaded rod extending down directly from the ceiling, grid, or ladder rack system. Two position height adjustments to accommodate system with or without hinged cover. Bracket is secured to threaded rod with two nuts. 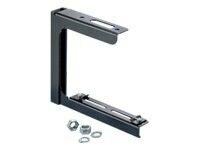 The pre-assembled slide clamps enable fast assembly to channel.